Well I've spent a little bit of time lately working SBX2. A midst all of the things going on I actually set aside some time to get a few things done. Work is boring still but pays alright, the wedding coming up soon is taking a lot of planning. A lot. That's... fun. Sorta, exciting for sure but there is a lot to get done. Other than that still trying to get a job in the game industry, but I've not been applying as much because of the wedding soon. After I get married I'll be putting in a lot more work into trying to get a job in the video game industry. I've picked up a book on blender and have been working through it to start making 3d models. Once I finish the book and start working on a few of my own projects I'll post them up here. Also I've got quite the guild started for Topia online and eagerly await the upcoming beta to push this thing to the limits. Our guild has scripters ready to see what we can do with the game. Some new things have been added! I have a new area that you can find in Level 3 that is a platforming area and added the graphics for a new character. His dialogue / what he does for you is not in the game yet and when I add it you'll see what happens! Talking to Ol' Ray will open up a new area after you beat level 3 with a special Mini Game! For now it's gonna be a secret but you should enjoy a fun side game in the game once I release it. Also I have added new collectibles in the Secret Area of level 3 and you will be able to start looking in the explorable platform sections with items you acquire in other areas. 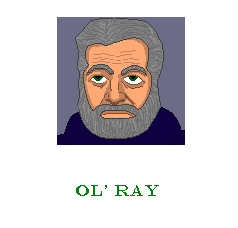 I will probably touch up Ol' Ray's portrait, there is some work left to be done on it, but hope you like! Look for new stuff soon, my unofficial resolution is to get more work done on my projects.